CustomInk had an early start selling custom t-shirts online in 1999. They really blazed the trail in many ways with one of the first and most powerful t-shirt design tools, displaying uncensored customer reviews, and fanatical about great customer service (see our interview with the founder of CustomInk). As a result they have been very successful with over $80 million in sales last year. It is a lot and there is a big considering most of the other custom t-shirt companies on the first page of Google probably only do about $3-12 million (excluding Zazzle/Cafepress who are 100M+) so there is a giant gap that many companies are trying to fill. When trying to take on CustomInk many companies have tried to replicate their moves but many times they are trying too hard to do exactly the same thing. Should your t-shirt company try and offer low prices, have a great t-shirt design tool, have happy customers through excellent customer service? YES! You should strive for that. BUT, you cross the line when you replicate website layouts, t-shirt clipart, or website text. A few months ago t-shirttalk reported evidence of ShirtMagic plagarism and so ShirtMagic displayed a banner on their website announcing to their customers that they had copied CustomInk. At the time I thought this was based on the companies connecting but it was actually a lawsuit brought on by CustomInk which you can pay to download here. Well another t-shirt company Ooshirts is now in hot water with CustomInk. You can pay to download the documents about the formal complaint. I will share a few parts with you here and want to remind you that this is a complaint, and that Ooshirts has not been charged as guilty. Regardless there are some important things to learn from this case. 1. Ooshirts copied core creative elements of the CustomInk website. 2. Ooshirts copied hundreds of proprietary graphic designs. 3. Ooshirts was conducting false marketing of their services and unlawful tactics to mislead consumers. 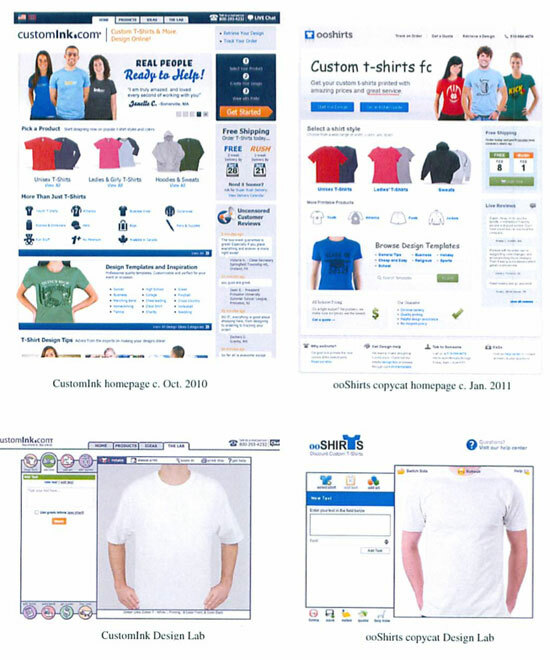 In 2007 Ooshirts posted requests on freelancer websites/ads for a webdesigner “to create a custom t-shirt website, like customink” and linked to the t-shirt designer and price calculator page. The final product that went live had copied many of the key elements. In 2010, Ooshirts AGAIN posted a freelance listing to make their homepage look more like CustomInk and included multiple references and a html link to Customink. According to CustomInk, by 2011 both the design tool and the homepage looked just like CustomInk. 2. Ooshirts copied hundreds of proprietary graphic designs. Over 180 clipart elements were blatantly copied from Customink. The ones on the top are the CustomInk originals, the others are the ones created by Ooshirts at a later time. If you want more info on the case you can always read the court doc yourself. Who knows if this will actually go to court or if they will find a way to settle. Is Ooshirts the first company to try and copy Customink? Of course not (see how many requests there have been) but it was hard for CustomInk not to notice when Ooshirts has started to frequently take the #2 spot (below CustomInk) on Google for custom t-shirt related searches with a strikingly similar looking website. The reason I wanted to post this is to show that there are potentially serious consequences (i.e. lawsuits) for copying designs, websites, or text. Be cautious, be original. OOShirts.com is Horrible! Don’t shop with them. They will print your shirts off-center and then do nothing about it.